A placeholder tonight as nothing of importance happened today except things very much like things that happened yesterday. My bad higher level class was bad. My lower level class wasn’t quite as bad. My worst students in my high school class were bad. The only funny thing was in my high school class. My worst students were third in line for their presentation but rather than prepare for it (it helps to practice even though they don’t have to memorize it) they were doing homework from other classes. When I called their number the moseyed up to the front and then 1) couldn’t figure out who was speaking first or 2) what order their pictures were supposed to be in. I sent them off to get their s#!t together. One student realized that thanks to his partners he was about to fail and managed to salvage something resembling a presentation by playing stage manager. Unfortunately he’s right. He is going to fail because of this partners. That’s one of the rules of the assignment. This entry was posted in Japan, Teaching, Work on November 30, 2016 by DELively. What happened first wasn’t that surprising. What happened later was. As predicted, the noise and inattentiveness of two classes inspired me to stop talking about the final exam. Instead I passed out an assignment and said “good luck”. Later I helped the students who actually seemed interested in passing. Then, this evening, as I was grading daily journals written by my university students, I realized that one of my students wrote well enough that he could have been an editor for Wikipedia. Actually, given that his “handwritten journal” matched a Wikipedia entry word for word, I suspect he might already be a Wikipedia editor. Or is it adopter? Either way, all the students are now required to look up the word “plagiarism” and explain what will happen to them if they try that in the USA. The trap is that I expect most of them to plagiarize the entry, which will lead to a teachable moment. The best part about the last week of school is that most class time is spent reviewing or finishing projects which means I don’t have a lot of prep work to do. The students like it because I don’t mind letting them fail. For junior high school, I typically discuss the material that’s on the exam and give students a version of the long writing question on the exam to practice. One third of the class works on it; one third pretends to work on it but ekes out only one badly written sentence; and one third plays, talks or sleeps. I just let everyone do what they want. I’m not taking the exam and if someone doesn’t write the essay/long writing, it saves me time and energy. I’ve mentioned before how, in the past, I’ve stopped explaining the details of what to study when it was clear that most of the class wasn’t listening. In the worst case, I erased what I’d already written and wished them luck. Later I gave the information to the few students who were actually interested in passing and suggested they share with other students. With high school we’re finishing up final projects and that means there are lots of excuses and pleading. Students are also prone to take 15-20 minutes toilet breaks. (As these are usually my worst students, I just let them go and don’t chase them down.) The last class is usually spent reviewing the term’s material, but I see students doing math or other classes. I also see students sleeping. Once again, I encourage them to enjoy themselves. Tests that add up to “0” are really really easy to mark. This entry was posted in Japan, Teaching, Work on November 29, 2016 by DELively. We’re gearing up for the last week of the term. That means anything that can go wrong probably will. Even if it doesn’t, all hell breaks loose. The last week of the term is marked by a number of key things that often cause more trouble than they are worth: Finishing exams and chasing down students. For the former, we have to make the exams, including the listening scripts, and then record, edit and burn the listening files. Traditionally I waste two CDs in the process of doing this. Somewhere along the way, everyone has to approve the text of the exam and, even then, once exams are in student hands, we find a mistake. For the latter, chasing down students, this applies mostly to getting students to finish their final projects for their high school second year classes. If they don’t do it, they get the lowest possible for score for the term and have to take a make up exam. As it is, I’ve got a student who’s two speeches behind and has already earned zeros on them. I expect I’ll see him at the make up exams. After all that, we get the written exams in hand and things get really crazy. This entry was posted in Japan, Teaching, Work on November 27, 2016 by DELively. Today I read a paragraph that was so bad that I actually got mad at the student who wrote it. Luckily that student wasn’t around. The paragraph in question was part of a course I teach that prepares students to go overseas. My job is to read, mark and assign a mark to the paragraph and then follow a complicated online system to return the document to the students. The trouble is, sometimes the students use online translators. They enter entire sentences in Japanese, translate it into English, then send it on as original work. The problem is that translators, at this point in their development are mostly crap. The English ends up semi-coherent, if the student is lucky, or incoherent. Today’s sentences were so bad I couldn’t figure out what the student was trying to say which meant I couldn’t fix it. I added a lot of marginal comments and an angry note. Next week I’ll check his first, when I’m still feeling patient and generous. This entry was posted in Japan, Teaching, Work on November 26, 2016 by DELively. It is a truth universally acknowledged, that the most difficult shot in basketball is a wide open lay-up. The problem is that the instincts that got you out in the open fail you as you approach the basket. You start thinking and trying to count steps and then you take the shot and it bounces off the rim, goes over the basket, or bounces off the bottom of the backboard. I suspect this is why the dunk was invented. Don’t do a lay-up, just jump and drop the ball in the hoop. As for me, most of my problems in basketball came from not thinking. Or, more specifically, thinking too much in the wrong direction. When we lived in Hayden, Colorado, for reasons I don’t remember (probably my request) we put a basketball hoop and backboard on our house. I still couldn’t do a lay-up and that inspired me to improvise. I stood on something (the bumper of my dad’s pick up?) and decided to attempt a dunk. The first part went well as I managed to dunk the ball. However, for reasons I don’t remember, I decided to try hanging on the rim. The entire basket and backboard ripped out of the wall and we both fell to the ground. I somehow managed to remain uninjured, but the backstop got an impressive scrape. After that, the basket got put back in place, but I never liked that it had a scrape, even though I caused it. This entry was posted in Life and Stuff, Personal, Random on November 26, 2016 by DELively. Happy Thanksgiving to everyone! Hope you have a great one, and don’t get injured wrestling for Black Friday sales. We woke to slush falling from the sky and, at some point, there was an earthquake that I, once again, didn’t feel, but what interested me the most was the snow. We got the first measurable snowfall of the year and Tokyo got its first November snow in 54 years. This was kind of fun, but it didn’t do me much good as none of the important train lines were down. This meant I got to school on time and had to teach regular length classes. It also meant that all my students, including the bad boys, were able to get to school. Luckily, because the trains important to my life were never affected, I was able to get home easily from my evening class. As freak snowfalls go, it wasn’t that freaky, but that was probably for the best. This entry was posted in Japan, Random on November 25, 2016 by DELively. The Takegami Notebook from Takegami Products is fountain pen friendly in an unfortunate way: Ink doesn’t bleed or ghost but the paper texture makes it unusable for all but a few fountain pens. The Takegami Notebook is made in Japan from 100% Japanese bamboo. The name is made from the letter 竹 “take” (pronounced the similar to “Takei” in George Takei) meaning “bamboo” and 紙 “gami” meaning “paper”. 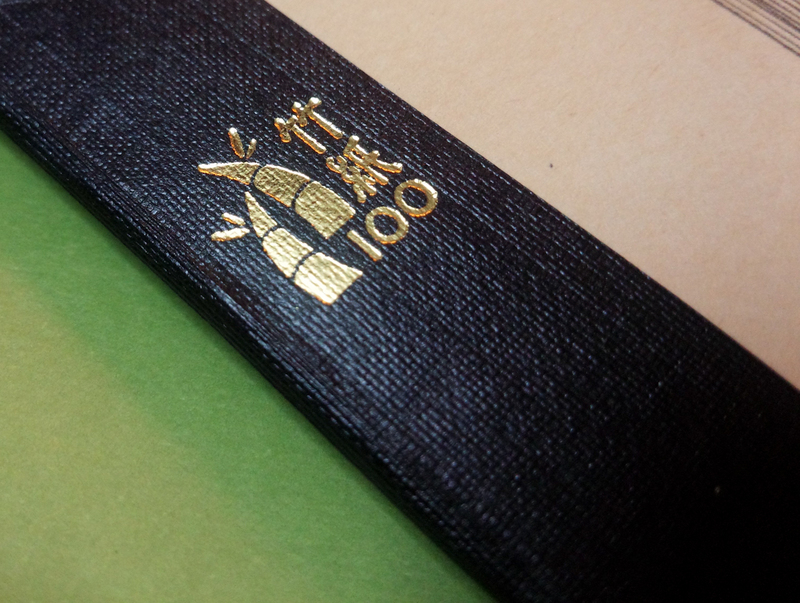 The logo with 竹紙, bamboo and 100. The two notebooks I tested are B5 sized and contain 60 pages (30 sheets) of fairly hefty ruled paper. The are saddle stitched with thread. One notebook is in a tan “natural” look with pages matching the cover. The other has white pages and a white cover. If you’re in Japan, I’ve seen them for sale in ItoYa. Otherwise they are available from sellers on Amazon. 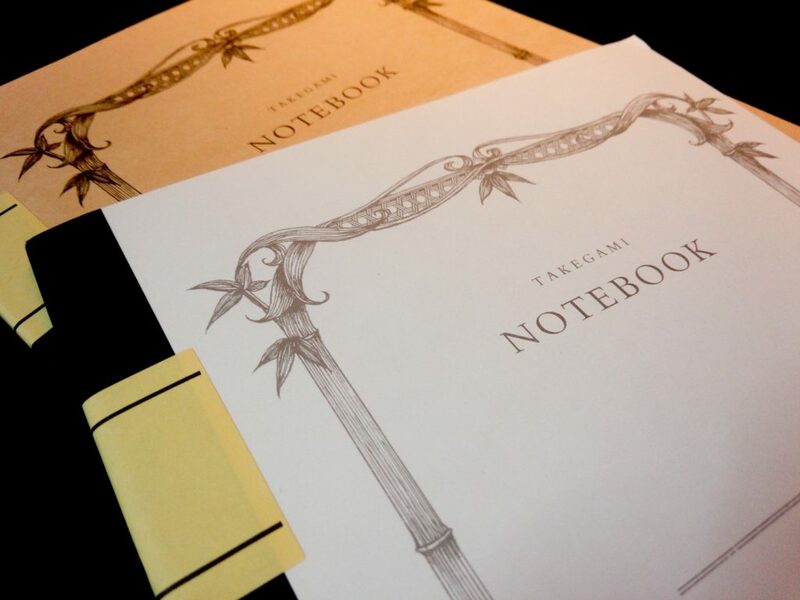 The two Takegami notebooks. I like the bamboo decoration on the covers. Although it felt good with ballpoint pens and roller ball pens–even pencils worked well–I found the tan version to be unusable for many fountain pens. The page has some natural tooth which makes any pen scratchy. My smoothest pens sounded like Platinum or Nakaya nibs (which sound like pencils being scratched across paper). My Platinum and my Nakaya sounded as if I was pressing my fingernails tightly against the paper and dragging them across. The Nakaya, especially, was unusable on the paper, despite having a broad nib. The white notebook was better, although it had a bit more ghosting. I disliked the tan version enough that I stopped using it. I’ll probably keep my eye on the company. I like the idea of notebooks made from materials other than paper. The white paper is usable, but I don’t like the size of the notebooks. I hope they stick around long enough to put out different shapes and sizes. This entry was posted in Japan, Paper on November 23, 2016 by DELively. Apparently there was a large earthquake this morning but I didn’t feel it. It apparently hit as I was getting dressed after a shower. In fact, it may have hit while I was still in the shower. All I know is at one point She Who Must Be Obeyed insisted there was an earthquake. This was confirmed by swaying lamps and laundry. After I realized how large the quake was, and that it had reached international news, I decided I’d better post that I’d not only survived, but hadn’t noticed. I turned on my computer to find messages from family members requesting I confirm that I had not faced catastrophe. Oddly, this isn’t the first time I’ve not noticed an earthquake. I do not know why this is, but it may have something to do with us living on the first floor (ground floor for those from the UK) and me not being as concerned about the ground shaking as I probably ought to be. The only consequence I faced was a delay in the start of school and the sudden belief among my students that a half-hour delay = no need to do anything. The final twist was, after I got home from work tonight, She Who Must Be Obeyed asked if I’d felt the earthquake. I asked when it had happened. She said it had happened 20 minutes before. Of course, I hadn’t, which kind of worries me. This entry was posted in Japan, Life and Stuff, Random on November 23, 2016 by DELively. Was abnormally busy today and that has me repondering my suggestion for birthday rulin’s (aka new year’s resolutions done on your birthday). The main hassle I have is that my birthday arrives at the start of the busy season at the school where I work. Exams must be written. Listening tests must be recorded. Souls must be crushed. On top of that, I have three other part time jobs (two that require travel and one that can be done at home) and those eat up time. Because I didn’t rethink the rulin’s on Saturday when I had more time, even though I was actually working at home, I won’t be able to do them until next Saturday, and then only if I’ve finished my work at home work. The advantage of the new year is that there’s a few days off and, with the proper balance of booze, you might be able to hammer out some proper resolutions. That said, I’m still working on my rulin’s and hope to get them posted on Wednesday when we have a national holiday. This entry was posted in Life and Stuff, Personal, Random on November 21, 2016 by DELively.